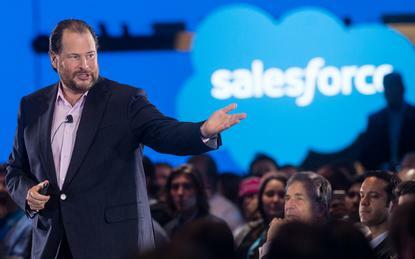 Salesforce is in advanced discussions to acquire U.S. software maker MuleSoft, people familiar with the matter told Reuters on Tuesday. The move comes as the tech giant looks to expand its offerings beyond customer relationship management software. The acquisition, which could be worth more US$6 billion, would be Salesforce's biggest ever deal, illustrating CEO Marc Benioff's push to supplement the vendor’s cloud-based portfolio with new technology. A deal could be announced as soon as this week, the sources said, cautioning that negotiations had not been finalised and that an agreement was not certain. The sources asked not to be identified because the negotiations are confidential. Salesforce and MuleSoft declined to comment. MuleSoft shares jumped more than 20 per cent to US$39.88 after Reuters reported the talks, giving the company a market value of US$5.3 billion, while Salesforce shares were up 0.3 per cent at US$125.31. Based in San Francisco, MuleSoft makes software that automatically integrates disparate data, devices and applications to help companies' networks run faster. Specifically, the acquisition could help Salesforce win business from customers which are not yet ready to transition their systems to the cloud. Buying MuleSoft would help Salesforce build a larger enterprise apps ecosystem around its own products, Barclays analysts wrote in a research note, adding that MuleSoft could command a premium given its rapid growth and good fit. Salesforce Ventures, the company's venture capital arm, led a US$128 million funding round in MuleSoft in 2015. MuleSoft has more than 1,000 customers, including Coca-Cola, McDonald’s, Spotify and Unilever, and went public about a year ago. Salesforce holds more than 18 per cent of the global customer relationship management software market, followed by Oracle with 9.4 per cent, according to 2016 figures provided by research firm IDC. Alphabet Inc's Google acquired a competitor of MuleSoft called Apigee Corp in a US$625 million deal in 2016.